The 2 minute video provides an overview of some of the performance challenges with leaf and spine fabrics and demonstrates Fabric View - a monitoring solution that leverages industry standard sFlow instrumentation in commodity data center switches to provide real-time visibility into fabric performance. Fabric View is free to try, just register at http://www.myinmon.com/ and request an evaluation. The software requires an accurate network topology in order to characterize performance and this article will describe how to obtain the topology from a fabric of Arista Networks switches. Arista EOS™ includes the eAPI JSON-RPC service for programmatic monitoring and control. The article Arista eAPI 101 introduces eAPI and describes how to enable the service in EOS. Enable eAPI on all the switches in the fabric. Copyright (c) 2015, Arista Networks, Inc. All rights reserved. 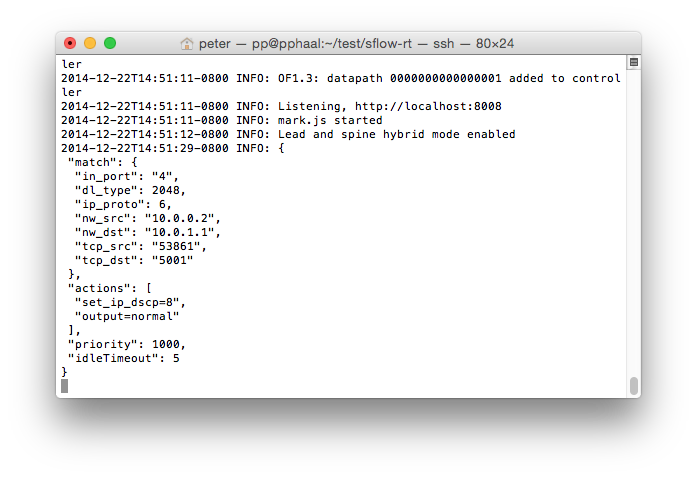 # Arista eAPI and generate output in json format recognized by sFlow-RT. Upload the JSON topology file by clicking on the disk icon in the Topology section. 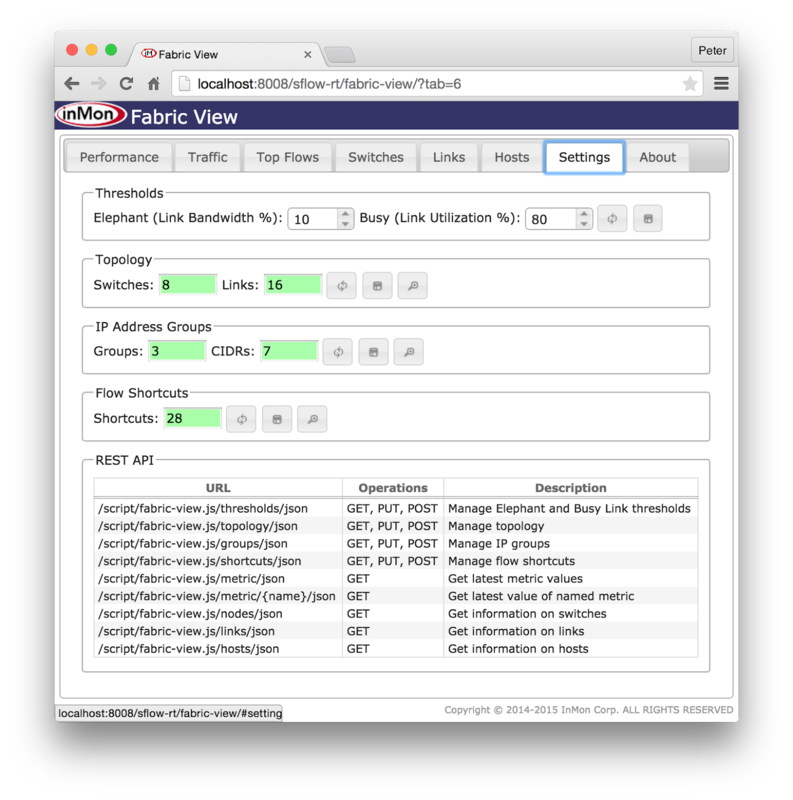 Alternatively, the topology can be installed programmatically using the Fabric View REST API documented at the bottom of the Settings page. 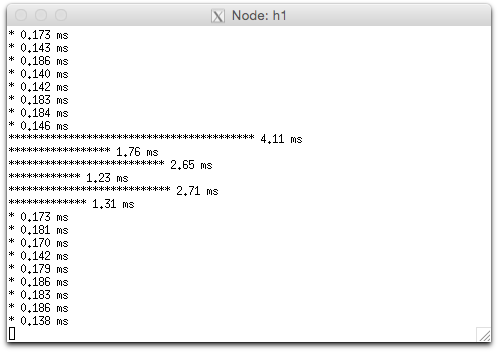 As soon as the topology is installed, traffic data should start appearing in Fabric View. The video provides a quick walkthrough of the software features. Accelerating Open vSwitch to "Ludicrous Speed" describes the architecture of Open vSwitch. 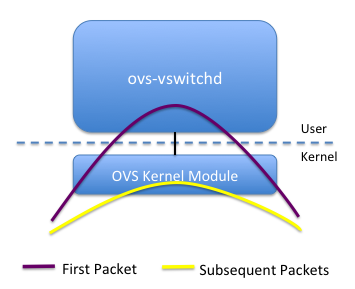 When a packet arrives, the OVS Kernel Module checks its cache to see if there is an entry that matches the packet. 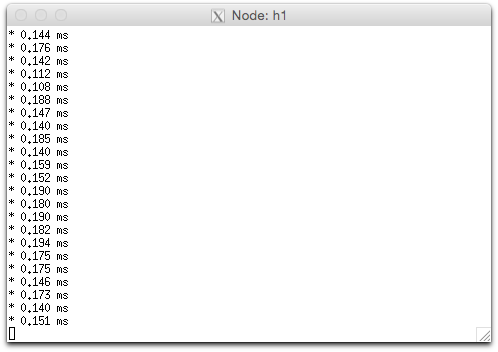 If there is a match then the packet is forwarded within the kernel. 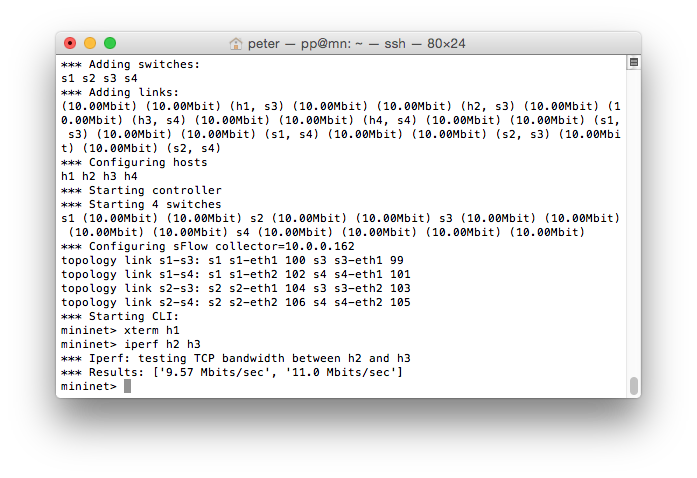 Otherwise, the packet is sent to the user space ovs-vswitchd process to determine the forwarding decision based on the set of OpenFlow rules that have been installed or, if no rules are found, by passing the packet to an OpenFlow controller. Once a forwarding decision has been made, the packet and the forwarding actions are passed back to the OVS Kernel Module which caches the decision and forwards the packet. 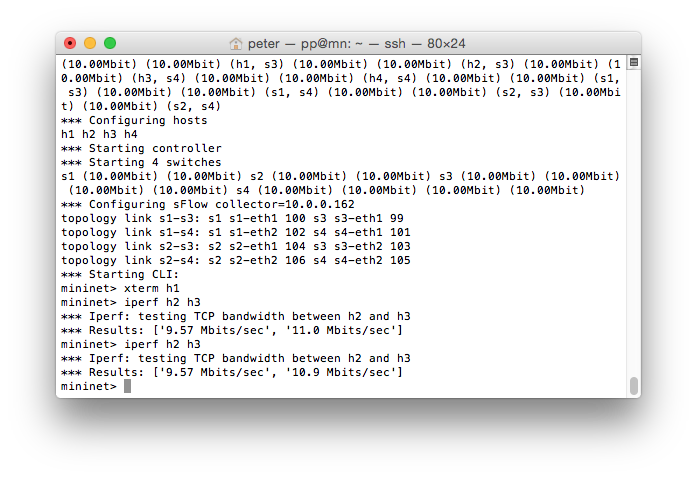 Subsequent packets in the flow will then be matched by the cache and forwarded within the kernel. The recent Open vSwitch 2014 Fall Conference included the talk, Managing Open vSwitch across a large heterogeneous fleet by Chad Norgan, describing Rackspace's experience with running a large scale OpenStack deployment using Open vSwitch for network virtualization. The talk describes the key metrics that Rackspace collects to monitor the performance of the large pools of Open vSwitch instances. 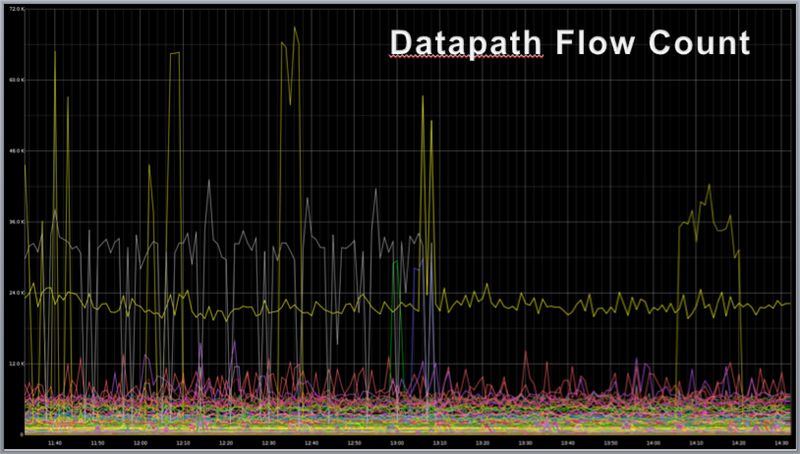 This article discusses the metrics presented in the Rackspace talk and describes how the embedded sFlow agent in Open vSwitch was extended to efficiently export the metrics. The first chart trends the number of entries in each of the OVS Kernel Module caches across all the virtual switches in the OpenStack deployment. 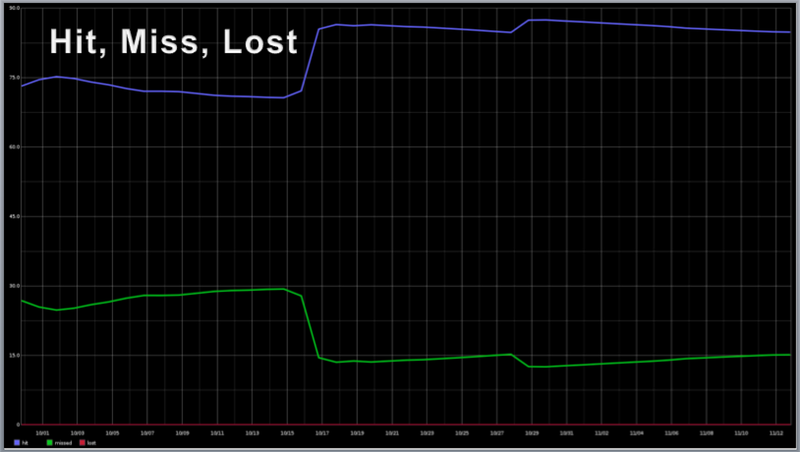 The next chart trends the cache hit / miss rates for the OVS Kernel Module. Processing packets using cached entries in the kernel is much faster than sending the packet to user space and requires far fewer CPU cycles and so maintaining a high cache hit rate is critical to handling the large volume of traffic in a cloud data center. 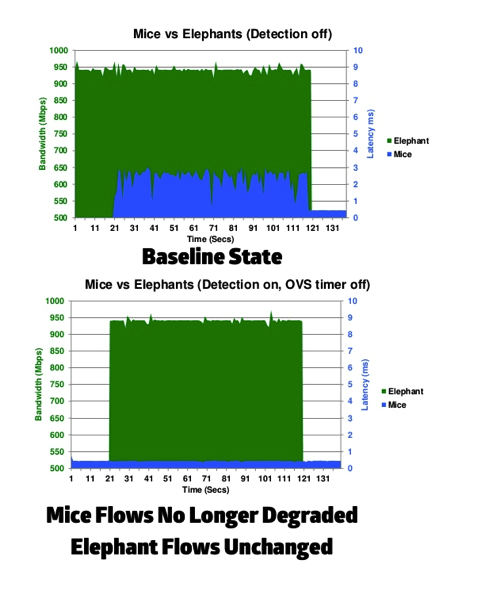 The third chart from the Rackspace presentation tracks the CPU consumed by ovs-vswitchd as it handles cache misses. 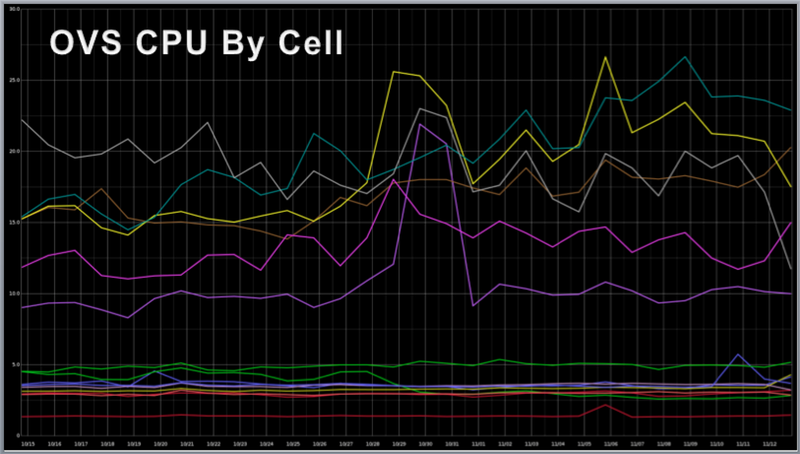 Excessive CPU utilization can result in poor network performance and dropped packets. Reducing the CPU cycles consumed by networking frees up resources that can be used to host additional virtual machines and generates additional revenue. The sFlow agent was also extended to export CPU and memory statistics for the ovs-vswitchd process by populating the app_resources structure - see sFlow Application Structures. The Open vSwitch project first added sFlow support five years ago and these recent enhancements build on the detailed visibility into network traffic provided by the core Open vSwitch sFlow implementation and the complementary visibility into hosts, hypervisors, virtual machines and containers provided by the Host sFlow project. Broad support for the sFlow standard across the cloud data center stack provides simple, efficient, low cost, scaleable, and comprehensive visibility. The standard metrics can be consumed by a broad range of open source and commercial tools, including: sflowtool, sFlow-Trend, sFlow-RT, Ganglia, Graphite, InfluxDB and Grafana. Northbound APIs for traffic engineering describes how sFlow and OpenFlow provide complementary monitoring and control capabilities that can be combined to create software defined networking (SDN) solutions that automatically adapt the network to changing traffic and address high value use cases such as: DDoS mitigation, enforcing black lists, ECMP load balancing, and packet brokers. The recently published sFlow OpenFlow Structures extension addresses the challenge by providing a way for switches to export the mapping as an sFlow structure. The Open vSwitch recently implemented the extension, unifying visibility and control of the virtual network edge. 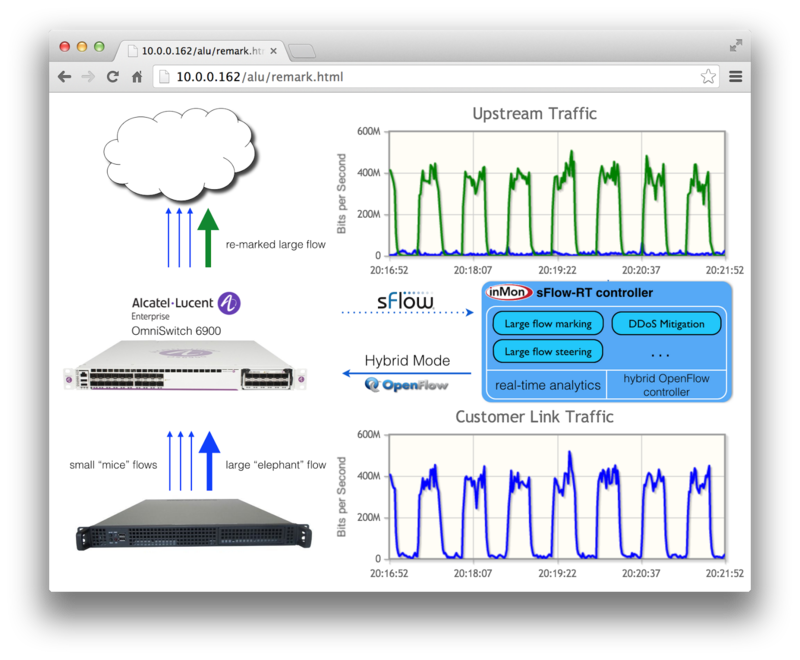 In addition, most physical that support OpenFlow also support sFlow. Ask vendors about their plans to implement the sFlow OpenFlow Structures extension since it is a key enabler for SDN control applications.